There is nothing like the amusement areas of New Jersey's famous boardwalks: arcades, the rides, concession stands, boardwalk food, games of chance and even psychics. Many have had their heyday become a distant memory. For example Atlantic City's amusements parks, Asbury Park's Casino and Tillie, and numerous other resort areas no longer offer rides, food stands and other commercial entertainment offerings. Yet the boardwalk amusement area at Point Pleasant Beach has endured since its origin in 1928. It is quite remarkable to think that people have been enjoying this quintessential Jersey shore experience for so many decades, right here Point Pleasant Beach. Jenkinson's amusements are just to the east of Little Silver Lake. 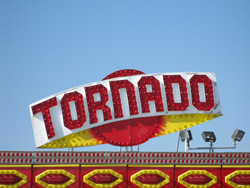 The northern amusement area is largely kiddie rides and the southern portion offers rides for more grown up folks. One economical way to enjoy yourself here is to plan a visit during a Wristband day. You can ride till your heart is content for $15 - as long as it is during Tuesday from noon to six or a Friday from 5 PM through 11 PM. The amusement area is open during the spring, summer, and fall with hours that change with the season. This popular attraction is open all year. There are two floors of exhibits, displays and tanks that feature exotic fish, mammals and even some birds. Numerous animals in the aquarium are fed on a posted daily schedule. Part of the fun of visiting is being able to watch "feeding time." There is also a petting tank and a fossil room to explore. An important focus of the aquarium is education and its excellence in this area is reflected in their being accredited by the Association of Zoos & Aquariums. Jenkinson's Aquarium holds many workshops, hosts children's outings from schools and other organizations and teaches a lot of people about the ocean and conservation. You can contact them directly (732) 899-1659 if you are interested in bringing a group to the aquarium. Open year round. Monday through Friday 9:30 a.m. to 5 p.m., Saturday and Sunday 10 a.m. to 5 p.m. Admission fees: Adults - $10.00 Seniors (62 +) - $6.00 Children 3 to 12 - $6.00 Children 0-2 - No charge. Martell's - Extending out over the beach the Martell pier has offerings that include food, arcade games and its popular Tiki Bar. Arcades - There are a number of arcades that feature video, pinball, skeeball and other games. Food, Sweets and Ice Cream - There are a number of food stands and shops that feature Jersey shore Boardwalk fare, ice cream and other sweet treats. Nightclubs - The Tiki Bar and Jenks feature live entertainment during the summer season. Fun House - A boardwalk classic, the Jenkison's fun house is right in the middle of all the attractions! People have been walking the boardwalk at Point Pleasant Beach for over 100 years. The first boardwalk here was put in place in 1890. It was promptly washed out to sea 1892. Since then storms and fires have taken their toll but for the most part the boardwalk has been rebuilt after every subsequent calamity. Once exception is when a hurricane hit the coast in 1938. 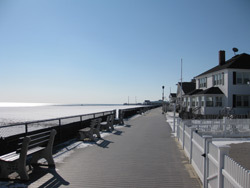 The southern portion of the boardwalk, which once extended to Bay Head, was lost and never replaced. The northern end of the boardwalk offers a nice view of the Manasquan inlet. The Inlet here is the unofficial northern end of the intracoastal waterway. This boating route follows the coast, goes around Florida and ends along the Gulf coast at Brownsville, Texas. The waterway is a series of bays, rivers, and some manmade watercourses. The system of navigable waters allows boats to travel along the coast without having to face what can be challenging conditions in the ocean and Gulf. So the next time you are standing at the end of the Point Pleasant Beach boardwalk, you can wonder where each boat may be going or where they have just been - maybe Florida, the Bahamas, or somewhere in the Gulf. Boats or no boats, thet northern most end of the boardwalk is also a nice place to watch the sunrise or sunset. Once you begin heading south from the inlet, you will be heading towards the busier commercial heart of the beach. Just south of the inlet is the Jenkinson's Inlet stands: ice cream and sweet's, a beach gift store, and a restaurant and bar (beach boardwalk food, soft drinks and beer!). Before and after the stands you will find benches lining the boardwalk along the beach side and on the west side is an interesting collection of homes. You walk along believing you are walking on the boardwalk and the people in the houses have a sense that you are in their front yard! 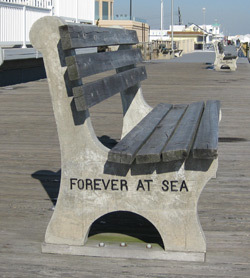 As you stroll along the boardwalk you notice that each of the benches has a few words imprinted on the base of each side. These memorials offer a mixture of names and sentiments - beloved husband, we miss you, wish u were here, forever at sea. It is an interesting touch and it can be fun to read each message as you are walking along. Towards the center and southern end of the boardwalk are the busiest areas in Point Pleasant Beach.The Martell's Tiki Bar complex, Franks, the Jenkinson's offerings - amusements, a nightclub, and aquarium - and more. For the southern end of things, there is Risden's bath house, some other stands, and then another stretch without any commercial things at the back edge of the boardwalk. 1892 - boardwalk washed out to sea!